Blame is an automatic response when we find ourselves in difficult situations. Politicians spend months debating whether the Democrats or Republicans are responsible for the problems facing our country. I wish they would focus less on pointing fingers and more on solving the problems. • Appeal to their selfish interests. Blame does not hurt the person we blame, it only hurts ourselves. Frame blaming in a way so they see how letting go of it will bring peace to their lives, improve their relationships and benefit their children. • Set goals. Where does your client want to be six months, two years and five years after the divorce? Will continuing to blame help them achieve their goals? • Encourage them to feel their pain.Researcher Brene Brown explains that we blame as a way to release our pain. Our clients need to hear it’s normal for them to be in pain during a divorce. Divorce is a grieving process. • Awareness. 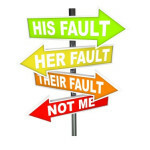 Ask clients to be aware when they are blaming. Often when we blame we don’t even know we are doing it. Once they are aware, they can take control. • Accountability. Ask clients to take a good, hard look in the mirror. What was their own contribution to the marriage breakdown? In Brown’s research she notes an inverse relationship between blame and accountability. Once a person becomes more accountable for their own actions, the less they will blame others. • Ask them to forgive themselves. Once clients become aware of the part they played in their marital breakdown, they must forgive themselves. What is done is done. Forgive yourself, learn from your mistakes, and move on with your life. • Focus on the future. When we blame we are focused on what has already happened and we see ourselves as victims. Ask clients to focus on the power they have in deciding how their future will look. If you have a client who is struggling with blame to the point it’s hindering the settlement process, encourage them to see a therapist or divorce coach. Often a neutral third party can help resolve some of the emotional pain so the divorce process can move forward. Erin Kassebaum provides mediation, coaching and parenting consulting services on a sliding fee scale. She is located in Bloomington. Please feel free to contact Erin with any comments or questions at 612.599.8366 or erin@resolutiondivorceservices.com.